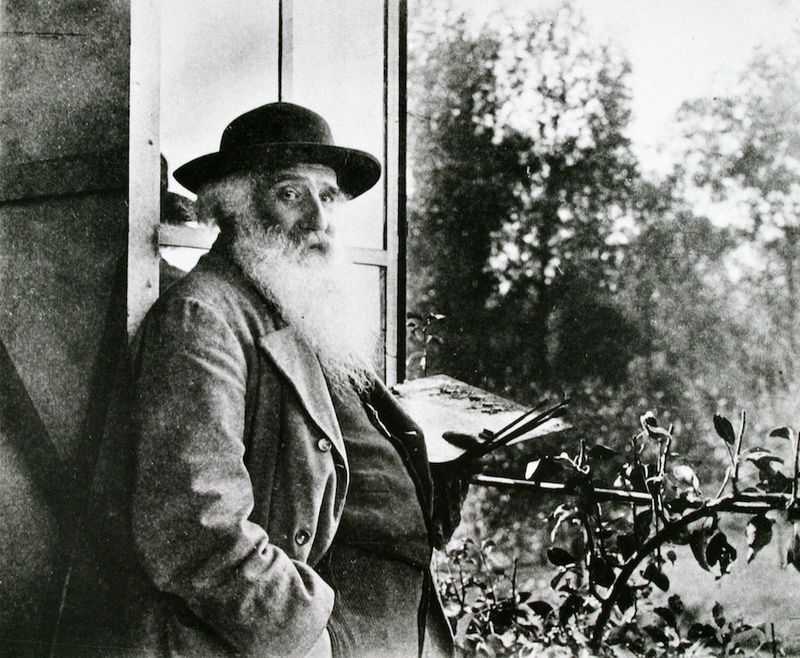 Many know french landscape artist Camille Pissarro for his influence on Impressionist and Postimpressionist painting. While his experimentations with art helped to shape the Impressionist movement with friends including Claude Monet and Edgar Degas, Pissarro also made an immense contribution to the printmaking of that movement, in which he was one of the most prolific and original of the peintre-graveurs. 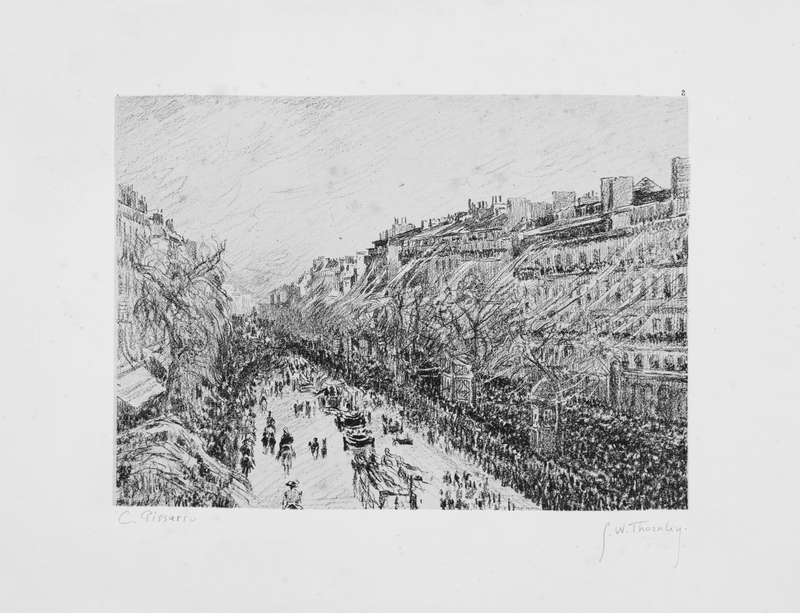 The early years of Pissarro’s printmaking were filled with experimentation and innovation in etching and lithography. The artist constantly reworked and changed his plates to trial new techniques with each impression. Despite his great enthusiasm for the experimentation and evolution of the medium, there was hardly any demand for his prints during the time. Pissarro abandoned printmaking for some time, until he finally reconsidered when a decade after his initial experimentations, print publishers began to champion the lithograph and demand began to rise. Pissarro / Thornley, “La Mi-Carême à Paris,” c. 1900, Lithograph, 8 x 10 in. 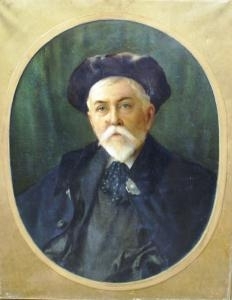 Pissarro learned of French lithographer Georges Thornley who was known for his prodigious technique and sensitivity with each print. The artist had witnessed Thornley’s previous joint ventures with Theo Van Gogh, brother to Vincent, and Edgar Degas. He decided to approach Thornley, who offered his cooperation in producing a series of plates based on Pissarro’s drawings. The two developed a rewarding working relationship that resulted in huge success. A portfolio was designed with twenty-five lithographs, executed by Thornley after Pissarro’s drawings and published in Paris, around 1895, in an edition size of 108 with the signatures of each artist. 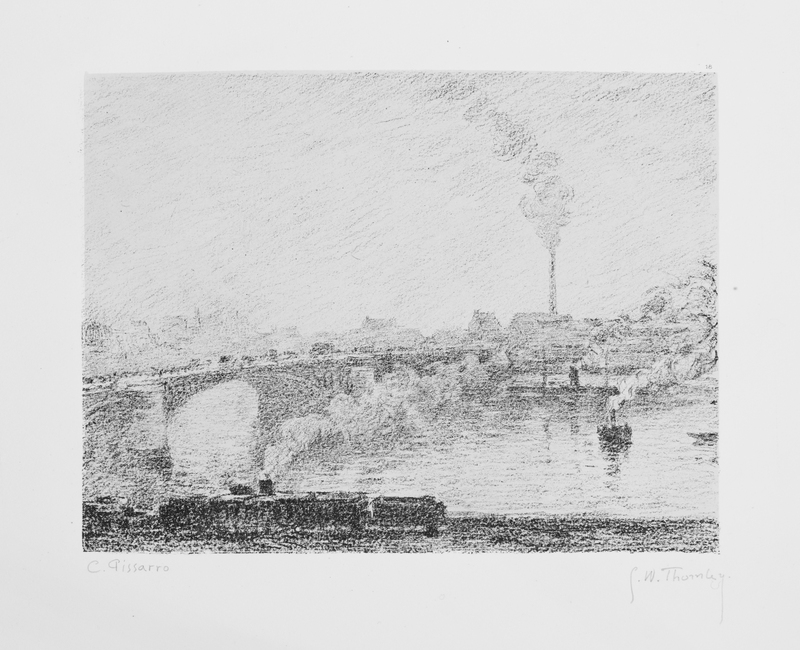 Pissarro / Thornley, “Ponts a Rouen,” c. 1900, Lithograph, 8.14 x 10.31 in. 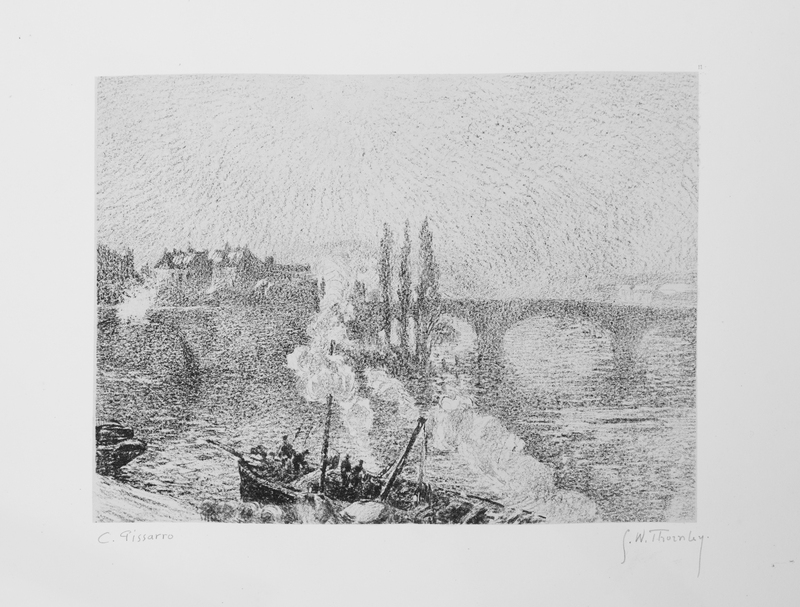 Pissarro / Thornley, “Ponts a Rouen,” c. 1900, Lithograph, 8 1/4 x 10 3/8 in.